If there’s a recurring criticism of the bike, it’s a lack of power. The venerable 750cc V-twin motor is reliable, tractable and easy to live with, but a few more horses wouldn’t go amiss. The stock output is 50 hp, and it’s difficult to raise that without extensive and expensive engine mods. There’s now a solution. It’s drastic and no doubt expensive, but it marries the immaculate looks of the V7 with a double shot of power: 110 hp, to be precise. 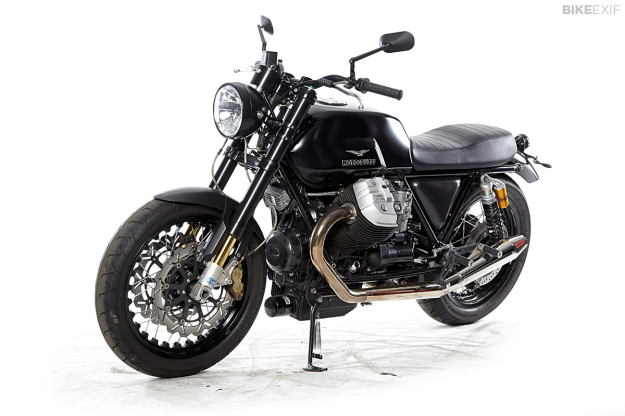 When a customer asked for a Moto Guzzi V7 custom with more grunt, Bronold proposed a combination of modern and traditional elements. 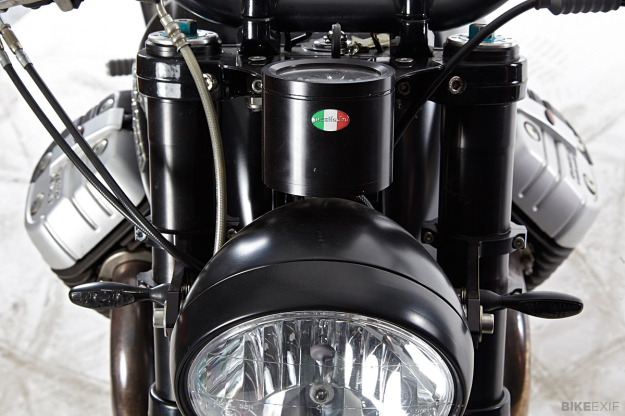 He decided to transplant a Griso 4-valve engine into a Tonti frame, while retaining the aesthetics of the modern V7. That meant developing, creating and testing parts. 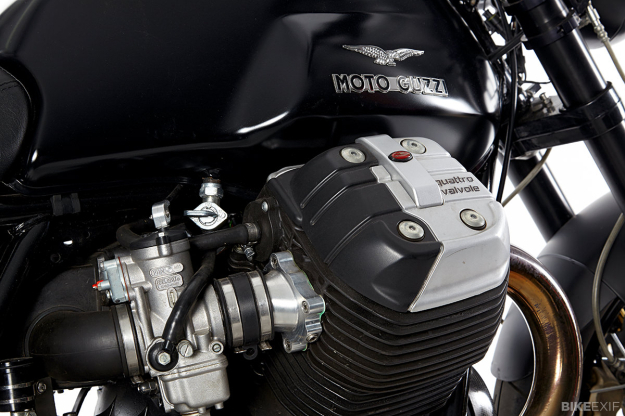 The V12 uses an older Guzzi gearbox, because the Griso transmission does not fit into a Tonti frame. Bronold also wanted carburetors instead of fuel injection, which meant matching the oval intakes of the cylinders to the circular outlets of the carburetors. As you can image, the list of alterations is rather long. 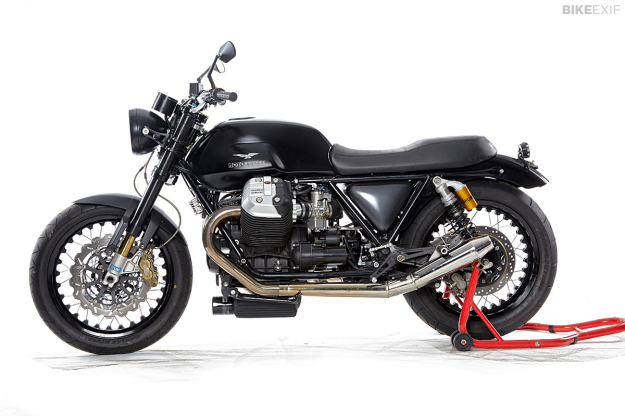 They include Kineo wheels, wave-style disc brakes with Brembo calibers, an upside down fork, a smattering of Öhlins components and lots of bespoke Radical Guzzi parts—right down to the exhaust system, foot pegs, and wiring loom. The craftsmanship is worthy of a bike rolling off the Mandello Del Lario production line. 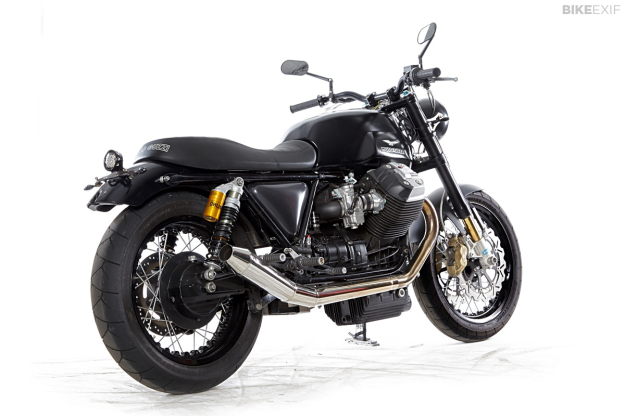 All the indications point to Moto Guzzi working on their own uprated version of the V7, so when that machine appears, it will be fascinating to compare it to Radical Guzzi’s effort. On a personal level, I’m sold. 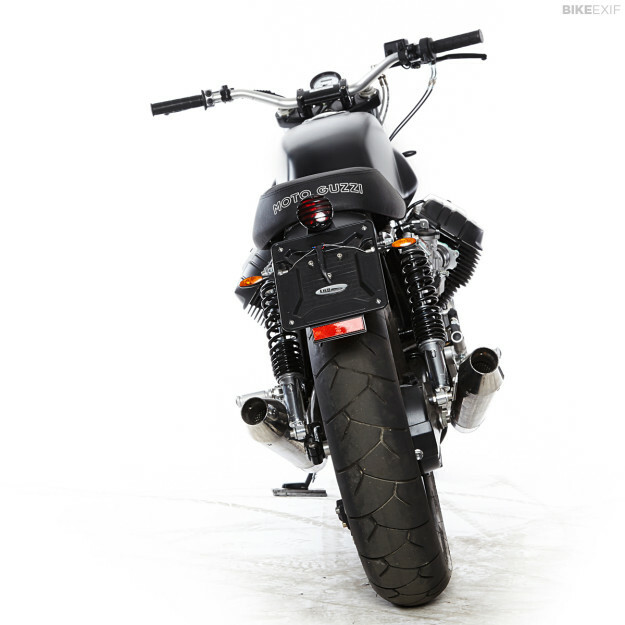 If you are too, contact Bronold via the Radical Guzzi website.